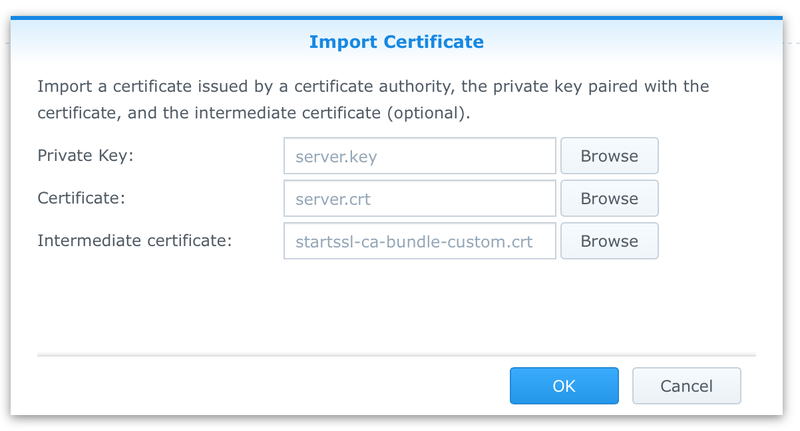 As I mentioned previously, I had switched my Synology box to have a real, live SSL cert from a trusted CA, StartSSL. That worked great for connecting via SSL to either the web console, or Chrome extension for Download Station. All worked swimmingly, until I discovered my OpenVPN connection wasn't functioning any longer. PPTP worked fine, but OpenVPN had issues. Turns out the Synology box, the OpenVPN server, and therefore, the OpenVPN client connection package, don't understand the StartSSL CA. Here was my process of discovery and resolution for this issue. I tried re-exporting the config, changing the hostname to the new Internet-facing hostname. That didn't work. I re-exported the .crt files from the server and included them in the .tblk file to import into TunnelBlick. That didn't work. In Control Panel > Security > Certificate, you may see that your StartSSL cert is already installed, which was the case in my situation. If this is true, export your certificates, so you have a known good copy of your server.crt and server.key. This will be needed on the next step. Import your server.key, server.crt and the new ca.crt (or whatever you called it) file generated above as the intermediate certificate. This took a bit to import and restart the web server. Go into Package Center and find VPN Server. "Stop", then "Run" the VPN server. Re-export the OpenVPN config and fix your client .tblk package for the clients. After this, I was able to successfully connect using OpenVPN to my Synology box again. Woo hoo! The extension does this by logging into the "Download Station" app on your Synology using your. This is great, however, there is one significant caveat. The Download Station Extension will only use http until you have a trusted SSL cert installed. In order to protect the credentials to your Synology and use SSL/https, this plugin needs a certificate that is trusted by your browser. And in order to do that, you need to install an SSL certificate on your Synology NAS that comes from a real Certificate Authority (CA). Now, to be clear, your Synology does have a SSL certificate already, but it's a "self-signed" certificate, meaning your server generated the certificate and it also validated it as being a good, trusted certificate. A post in the Synology Community Site describes how to go the process of installing a free StartSSL cert, however it involved significant ssh command line work, operating with openssl directly. Turns out Steps 1-6 in this guide are no longer necessary. You could probably still do the requisite work through ssh/openssl, however, according to the Synology guide here, you no longer have to ssh into the box to generate a certificate signing request or process the certificate returned from an SSL cert provider. Based on that, here's what you need to do. Go to the Synology guide, and perform steps 1-7. Proceed to the next step. 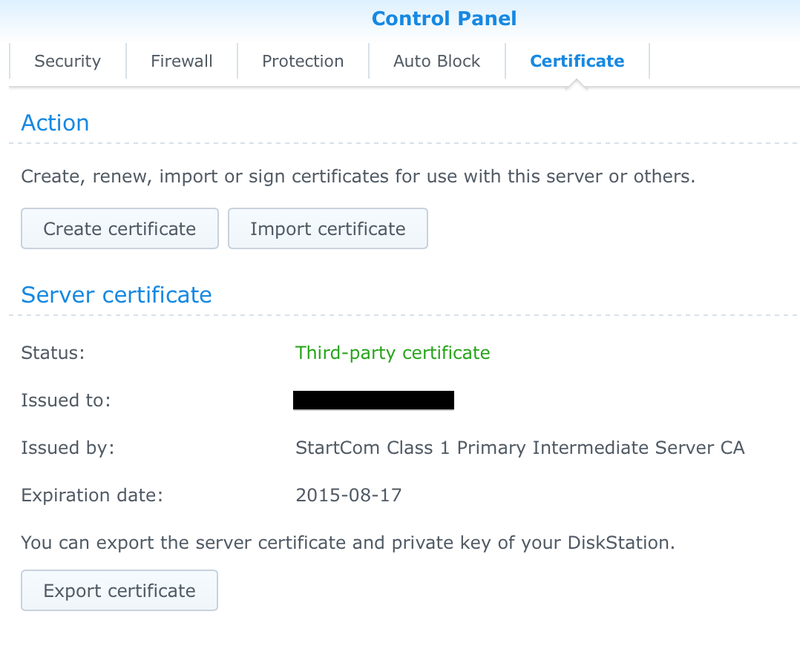 Use the Synology Community Site post by GNOE Inc. and perform steps 7-8.8 to generate the StartSSL-based (free) cert. Go back to the Synology guide, and perform the last steps on the page, 1-3. Make sure that the SSL certificate domain matches the domain you're using to access your NAS through the Internet. If the SSL cert and the domain don't match, you'll still get SSL cert errors and you won't get the benefits of this whole process. 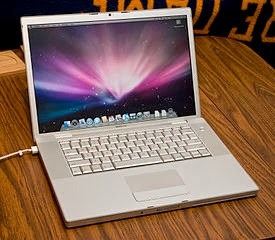 My first Macbook Pro was a 1st Intel generation, early 2006 model, that I bought from someone local on Craigslist in 2009. (Example to the right.) I cut my teeth there and got used to the Mac-isms and the Apple-isms about running OSX. That machine was't going to run any virtual machines well, so I never installed VirtualBox, Parallels or VMWare Fusion. That machine wouldn't install anything newer than 32-bit Snow Leopard. No Lion and no Mountain Lion. This was frustrating enough, and then software application makers moved to 64-bit entirely, so then I wasn't able to run the software either. So, in early 2013, I bought a new Macbook Pro and now I had the horsepower to run VMs. Woo hoo! Parallels pushes their marketing heavy on the Mac world. They have a lot of features, and seemed to have a lot of people who have used the product successfully. So I bought it too. 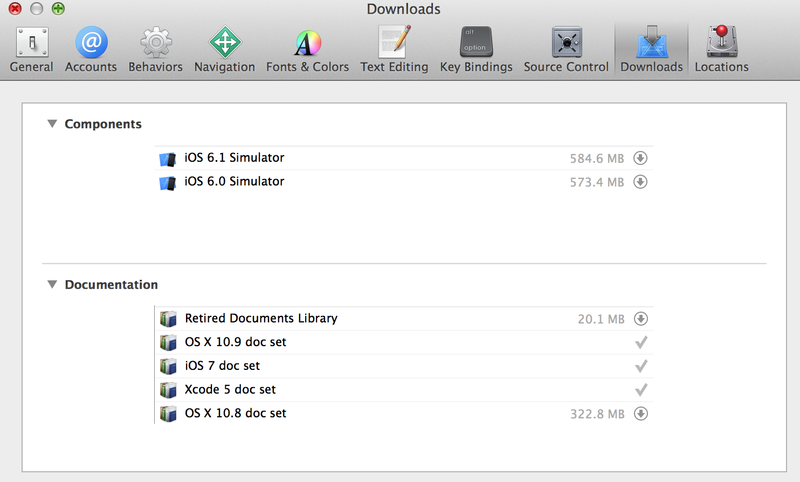 Fast forward to late 2013, and the release of Mavericks. Before I installed Mavericks, Parallels started warning me about Parallels 8 compatibility with Mavericks. I scoffed. All of the reviews said it ran just fine, and it has, but I have become increasingly resentful of having to shell out $50 for an upgrade, for little benefit. Step 1) Shutdown the Parallels VM, not just sleep, actually shut the machine down. Click on Continue. You'll be asked what you want to call this new VM. 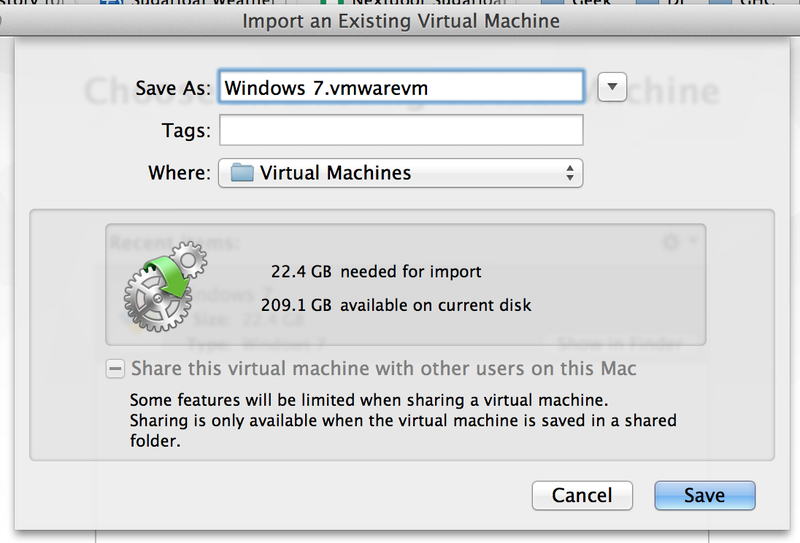 It will use the same base name, but then provide the VMWare extension .vmwarevm for the new virtual machine. You don't really need the whole machine, I don't believe, but the process does create the .vmdk disk image inside the directory named YourNameHere.vmwarevm which we will need in the next step. At this point, I fired up the Windows 7 virtual machine under VMWare Fusion and everything went swimmingly. I just wanted to make sure the new disk image was viable. Because of that, and because I didn't want to create any other issues I didn't install the VMWare extensions. I simply shut the machine back down again and moved on to Step 3. Second, we'll convert the VMWare Fusion disk image in .vmdk format to VirtualBox-import-capable .vdi disk image using a VirtualBox utility called VBoxManage. I then moved the .vdi image to my VirtualBox VMs directory. 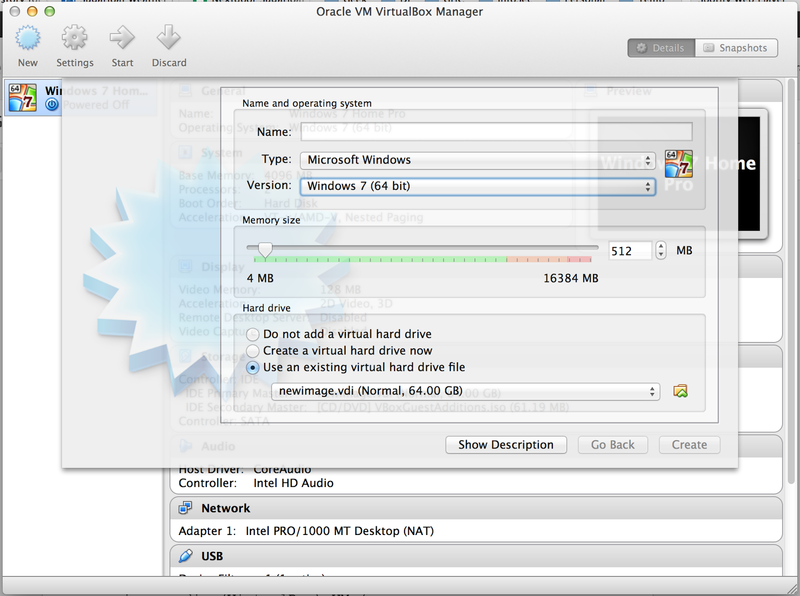 Third, start up VirtualBox and set up a new VM and choose an existing disk image. And this is the area where you'll choose "Use an existing virtual hard drive file". You'll have to then find the .vdi file and it will end up populating the area below the radio button. That's it. 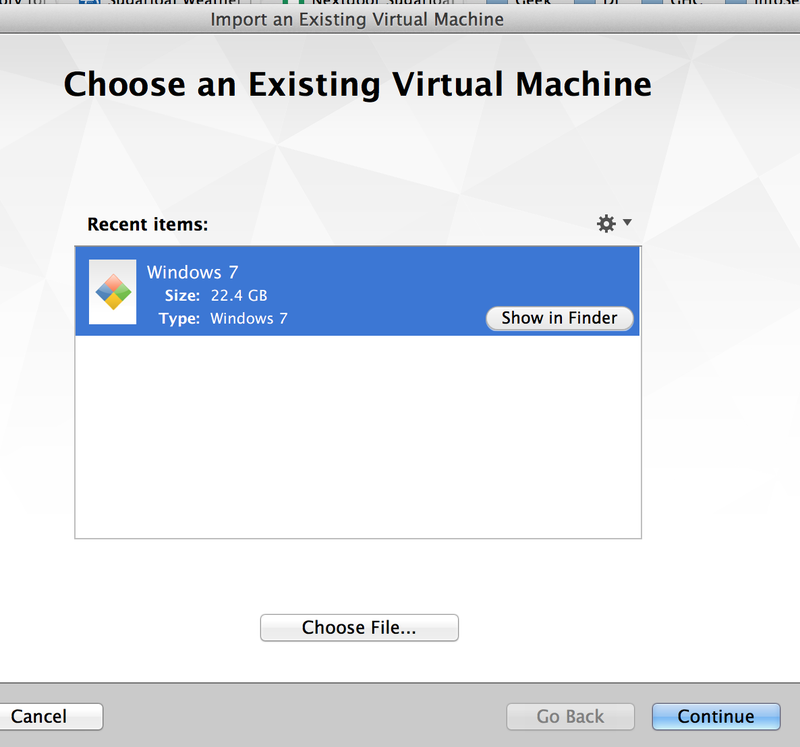 Fire up the new VirtualBox VM and install the extensions. Once you're satisfied with the fact that it booted and you're running Windows in VirtualBox on Mavericks on your Mac...you'll have to remove your Parallels instance. Windows will start barking that it is counterfeit. You'll have to reactivate your license on this VM. 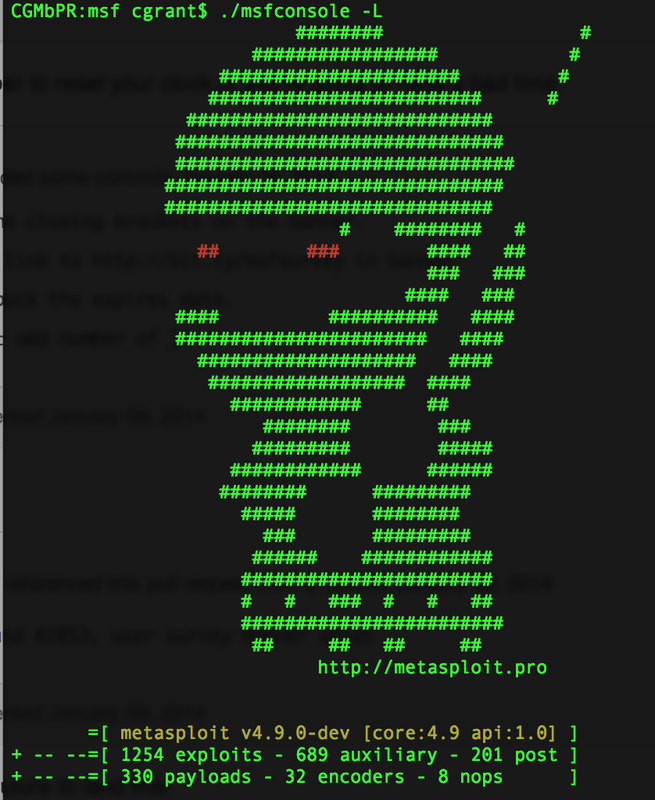 I've been struggling with getting Metasploit installed in my Mavericks (10.9.1) based MacBook Pro. The instructions I found weren't lining up with my experience, so I thought I'd write up my experience and how I was able to get it installed. He developed a script to a bunch of this work for you, however, I haven't tried it. I noticed that it is using an older version of ruby in the 1.9.3 tree. Go to https://developer.apple.com/xcode/ to download and install. Move to Step #2, unless you want to read through my experience. "Can't install the software because it is not currently available from the Software Update server." Other sites will also tell you that you need to check the "Command Line Tools" box in the XCode Preferences/Downloads tab. Notice it doesn't exist in XCode 5. Turns out, you don't need to install the command line tools, as they're included with XCode 5 (reading comments from this thread: http://www.computersnyou.com/2025/2013/06/install-command-line-tools-in-osx-10-9-mavericks-how-to/) . Verify they're installed by checking for gcc and g++. 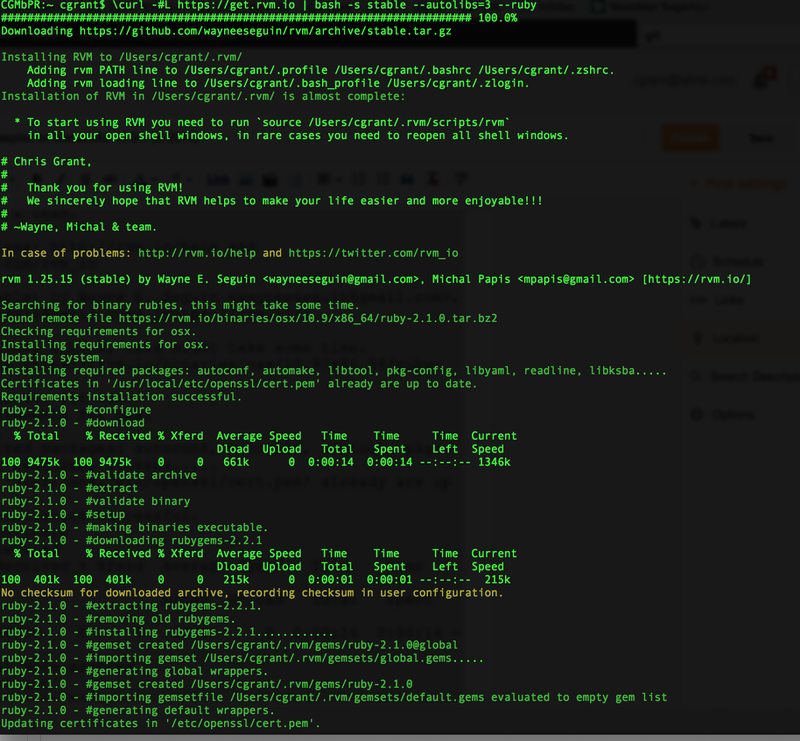 CGMbPR:~ cgrant$ ruby -e "$(curl -fsSL https://raw.github.com/mxcl/homebrew/go)"
Adding rvm PATH line to /Users/cgrant/.profile /Users/cgrant/.bashrc /Users/cgrant/.zshrc. 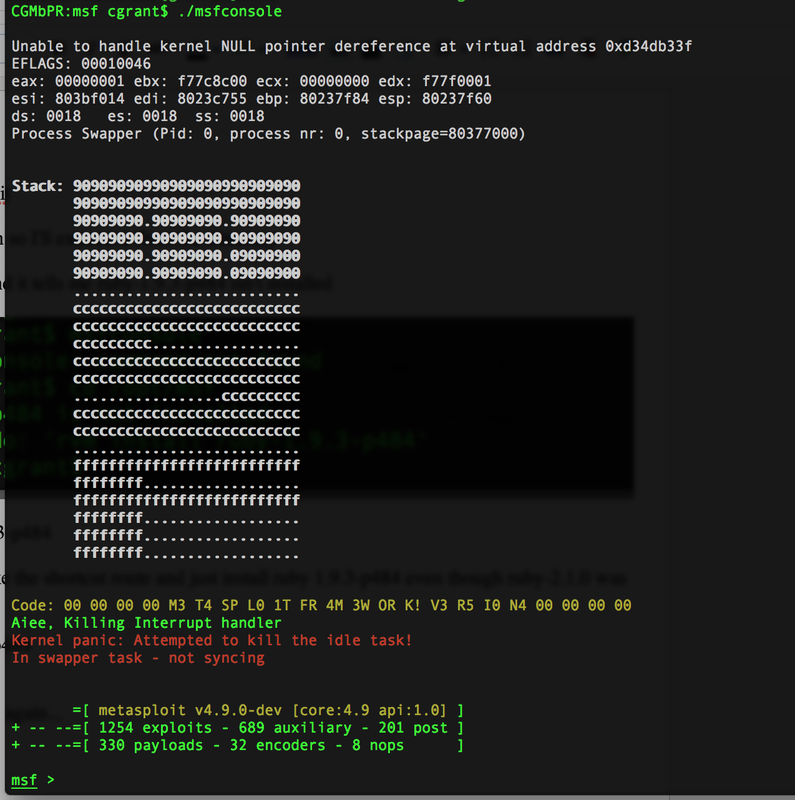 Adding rvm loading line to /Users/cgrant/.bash_profile /Users/cgrant/.zlogin. 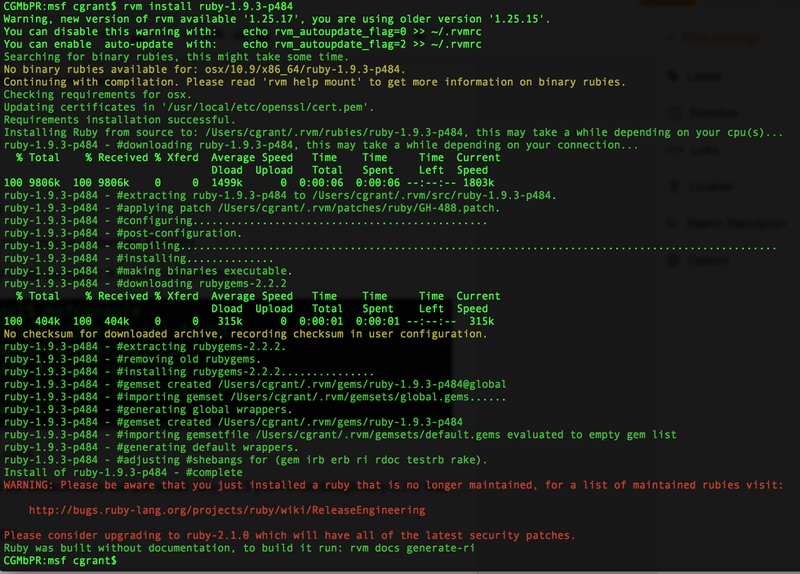 ruby-2.1.0 - #making binaries executable. ruby-2.1.0 - #removing old rubygems. ruby-2.1.0 - #generating global wrappers. ruby-2.1.0 - #generating default wrappers. Creating alias default for ruby-2.1.0. Recording alias default for ruby-2.1.0. This first step took quite a while. The guide I was looking at suggested I run the following, which I did. Other sites would have you run the following command, but looks like I have 2.1.0 installed so I modified it appropriately. remote: Reusing existing pack: 232980, done. Receiving objects: 100% (232985/232985), 198.63 MiB | 436.00 KiB/s, done. Resolving deltas: 100% (163073/163073), done. Checking out files: 100% (6515/6515), done. As I understand it, running bundle install installs the necessary ruby gems. This didn't work for me out of the gate. 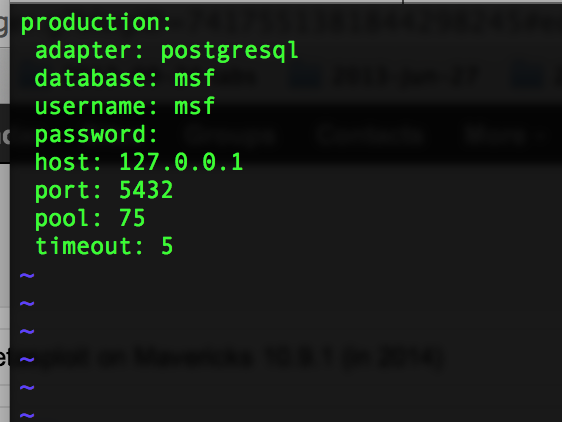 This is the error you get when you don't have Postgresql installed first. Then we need to finish with the gems metasploit needs to use. Well, I'll see if I can take the shortcut route and just install ruby 1.9.3-p484 even though ruby-2.1.0 was installed earlier. Okay, so now one of the gems isn't installed. 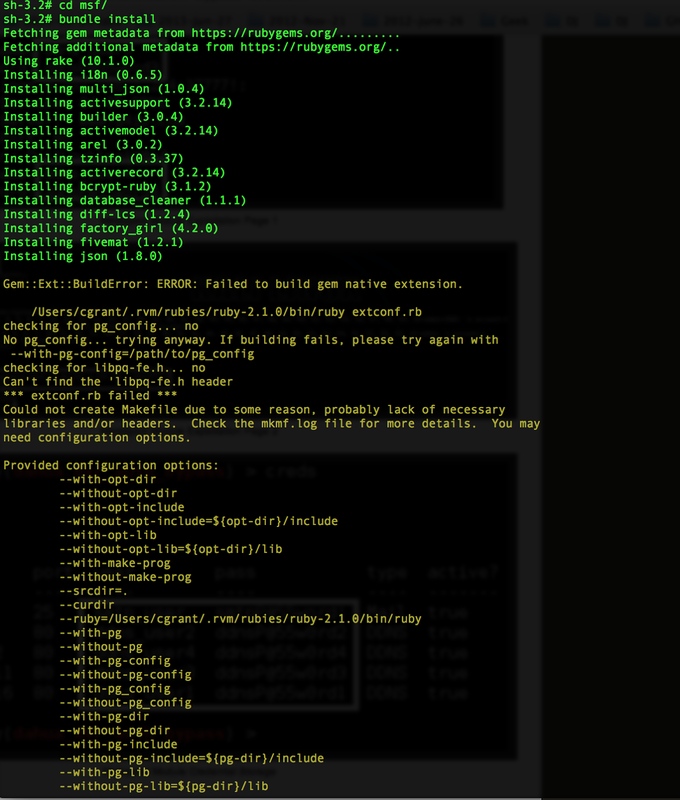 15) Okay, executing msfconsole again...and it worked! It worked! I freaked out a little first, then I realized that this was by design. All good!